Every now and again, Glasgow sees the small “pro-life” lobby come out of the woodwork. On Thursday 24th October, they planned a vigil in George Square and then a torch-lit procession to St Andrew’s Cathedral. In response, feminists and allies decided their own get-together to argue the case for women’s control over their own bodies. They easily outnumbered anti-abortionists, and produced loads of excellent signs, slogans and chants—”Keep you rosaries off my ovaries!”. Women’s access to abortion along with other reproductive rights remain a massive issue here and around the world. We only need to read the traumatic stories of women in neighbouring Ireland, where abortion is restricted. 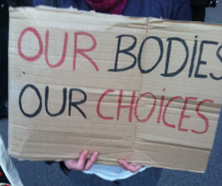 Those who campaign against choice need to be opposed. The counter-demonstration was organised and led by self-identifying women, who made up the majority, and male allies supported. Hopefully we’ll see more like it. Thanks to A Thousand Flowers for the picture.